The sun shone brightly on the white sand beaches in Montego Bay, Jamaica. A warm breeze rustled the palm leaves as gulls cried overhead. Stephanie gently stepped down onto the sand with the help of her father's steady arm. Steve was waiting for her in front of the ocean, grinning from ear to ear. 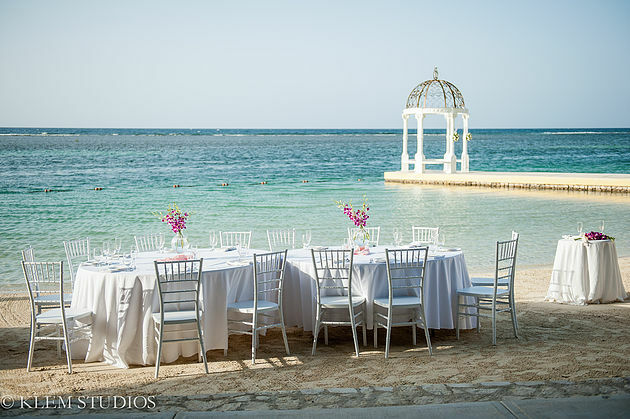 Their destination wedding at the Sandals Resort in Jamaica radiated relaxed elegance. Surrounded by a handful of their nearest and dearest, Steve and Stephanie exchanged vows and a passionate kiss to seal the deal. 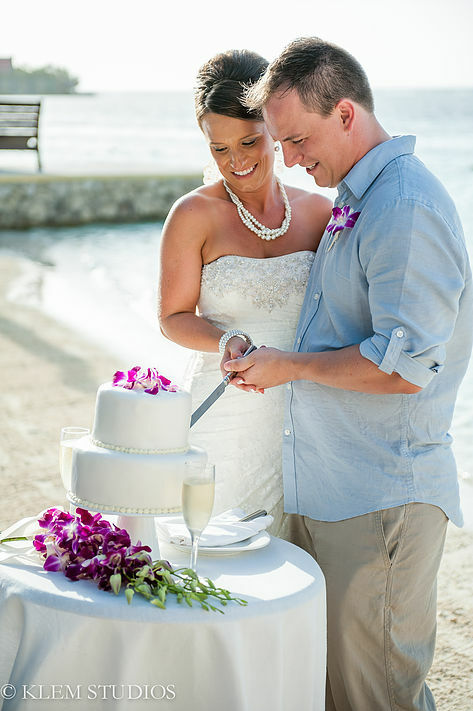 Stephanie was a stunning beach bride, and Steve exuded a GQ style in his khakis and linen shirt. Fast forward a few days, and we're back in Green Bay, Wisconsin. The dark skies above have decided to release a torrential downpour that heightens as Steve, Stephanie, and their faithful bridal party march through the Green Bay Botanical Gardens in search of a sheltered spot to take a few portraits. Needless to say, shelter was limited, as was our photo shoot. At the Riverside Ballroom, hundreds of guests are waiting to welcome Steve and Stephanie and celebrate their love. Their joyous affair is now complete as those who were unable to make the trip to Jamaica were able to be a part of their wedding day. Steve and Steph's Wisconsin reception brought a bit of the Jamaican beaches to their guests with decorations of sand, sea shells, and driftwood. Through sunshine and storms, I was in awe of how deep the love between Steve and Stephanie runs. Steve is a fierce protector of Stephanie. Her every want and need is his main priority, and he showers her with love and understanding. Stephanie's beauty and independence is only enhanced by her laughter and adoration for Steve. As an outsider looking in, it seems as if they are each other's saviors, with whom they can whether any battle that comes their way. Steve and Stephanie, I want to thank you again for taking me along on your whirlwind wedding adventure. A destination wedding is always a blessing to be a part of, and I thank you and your bridal party for being so welcoming. May you have years of happiness together as your love grows and flourishes. Much love and appreciation, Kate.